The Workbook Tools for Excel allow to quickly browse through Excel based models, automate tasks, organize and manage spreadsheets. Rotate through opened workbooks - a simple but powerful tool enabling you to browse through all open workbooks in the simplest possible way by clicking the 'Rotate through open workbooks' button. Browse through your opened spreadsheets - the tools that makes this task easy are 'Previous sheet' (goes back to the previous worksheet) and 'Next sheet' (goes to the next worksheet). Browse through your models - navigate through specific cells in a spreadsheet. Add and/or remove the cells to and from the 'Model Navigator' dialog box. Cell watcher tool allows a cell to be monitored all the time - this is ideal for complex models. Cells can be added or removed from the Cell watcher. The Cell watcher stores the cells in two groups: Output (cells containing formulas) and Input (cells with no formulas). Freeze or divide panes quickly - helps in the process of creating, navigating through, editing excessively long models and keeping an eye on them. Manage workbooks easier - The Workbook Manager tool can: List all open workbooks (even the hidden ones); Save workbooks; Save workbooks in other folders; Close workbooks; Create a hyperlink to another workbook; Hide workbooks; Show (unhide) workbooks; Delete workbooks; Activate workbooks; Open the folder a workbook is in; Rename workbooks and move them to another folder; Export workbooks as backups; Destroy workbooks permanently; Navigate through workbooks. 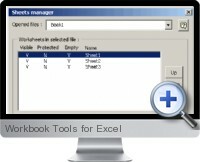 Manage sheets easier - The Sheet Manager tool can: Export the selected sheets; Hide sheets; Unhide sheets; Make the sheets very hidden; Show very hidden sheets; Protect sheets; Unprotect sheets; Rearrange sheets; Delete all empty sheets; Generate a Index of all existing sheets; Navigate between sheets; Add sheets; Rename sheets; Delete sheets. Register workbooks and sheets as favorites - stores a list of most frequently used workbooks. Arrange windows - allows to sort and display all open workbooks on the screen; furthermore, different areas of a workbook can be viewed. Manage the versions of your Excel models - check the progress of Excel modeling projects by adding hidden commentaries of significant occurrences, drawbacks, and/or pending tasks as the project progresses. Configure many functions in just one place, using toggle settings window - gain valuable time by automating repetitive tasks over multiple sheets such as view the same cell contents in all sheets, hiding rows, columns etc. Schedule your tasks directly in your sheets - To do list is a simple but useful tool, which allows the management any pending tasks related to a given workbook that may be key to the modeling project, in an ordered manner.